For the California wine region, see Saddle Rock-Malibu AVA. Saddle Rock is a village and a part of Great Neck in Nassau County, New York in the United States. The population was 830 at the 2010 census. The first settlers arrived in the 17th century. The Village of Saddle Rock is so named for an offshore boulder that gives the appearance of a saddle, first noted on a map in 1658. The village is also home to a historic mill. Officially known as the Saddle Rock Grist Mill, it was built circa 1700 and is located inside a small cove that opens onto Little Neck Bay off Long Island Sound. The mill is listed in the National Register of Historic Places and is the oldest continually operating tidal grist mill in the United States. The mill is now owned and operated by Nassau County as a working museum open to the public. The mill has been restored to its mid-19th century appearance and is located on Grist Mill Lane in Saddle Rock. The first Mayor of Saddle Rock was Roswell Eldridge, who was appointed "Acting Mayor" after he had incorporated his own private estate as the Village of Saddle Rock in 1911. In 1926, Eldridge's wife, Louise Udall Skidmore Eldridge, officially became the first female Mayor of Saddle Rock, and reportedly the first female mayor in the state of New York. Louise Eldridge served as mayor from 1926 until her death in 1947. She was also the last private individual to own the grist mill. From 1991 to 2009, the mayor of Saddle Rock has been Leonard Samansky, having been elected to eleven consecutive terms as of 2010. He was the mayor of Saddle Rock until his death in the Summer of 2011. The newly elected mayor is Dan Levy. Saddle Rock is located at 40°47′40″N 73°44′56″W﻿ / ﻿40.79444°N 73.74889°W﻿ / 40.79444; -73.74889 (40.794469, -73.748876). 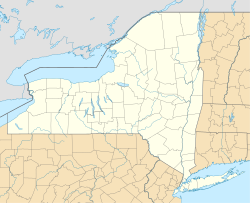 According to the United States Census Bureau, the village has a total area of 0.3 square miles (0.78 km2), of which, 0.2 square miles (0.52 km2) of it is land and 0.04 square miles (0.10 km2) of it (7.69%) is water. As of the census of 2000, there were 791 people, 265 households, and 236 families residing in the village. The population density was 3,239.8 people per square mile (1,272.5/km²). There were 275 housing units at an average density of 1,126.4 per square mile (442.4/km²). The racial makeup of the village was 90.39% White, 0.76% African American, 6.19% Asian, 1.01% from other races, and 1.64% from two or more races. Hispanic or Latino of any race were 1.77% of the population. Ancestries: Russian (10.5%), United States (9.7%), Arab (9.4%), Polish (5.8%), Hungarian (2.0%), Lithuanian (1.9%). There were 265 households out of which 34.7% had children under the age of 18 living with them, 81.5% were married couples living together, 3.8% had a female householder with no husband present, and 10.9% were non-families. 8.7% of all households were made up of individuals and 7.5% had someone living alone who was 65 years of age or older. The average household size was 2.98 and the average family size was 3.15. In the village, the population was spread out with 23.1% under the age of 18, 7.6% from 18 to 24, 15.7% from 25 to 44, 33.6% from 45 to 64, and 20.0% who were 65 years of age or older. The median age was 48 years. For every 100 females, there were 95.3 males. For every 100 females age 18 and over, there were 92.4 males. The median income for a household in the village was $125,630, and the median income for a family was $137,962. Males had a median income of $92,073 versus $40,625 for females. The per capita income for the village was $63,242. About 3.4% of families and 3.0% of the population were below the poverty line, including 4.8% of those under age 18 and 4.0% of those age 65 or over. ^ a b Goldstein, Judith S. (2006). Inventing Great Neck: Jewish identity and the American dream. Rutgers University Press. ISBN 9780813538846. ^ "The Gold Coast of Long Island". Eldridge successfully lobbied the state legislature and the governor of New York to change the state law’s minimum requirement to organize a village from 250 residents to 50. By including his family and his servants, Mr. Eldridge incorporated his estate and set a precedent that was emulated throughout the Gold Coast...the huge upsurge in the population in the twenties witnessed no less than twenty-one “golf club” village incorporations. Many of these “villages” were little more than three or four estate owners banding together to form a municipality. ^ "History of Saddle Rock". ^ "Saddle Rock, New York". Retrieved 2013-11-14.